Chupi is a great summer break from the heat. Although it may seem overly crowded on busy days, the atmosphere is fun and friendly and there is plenty of water for everyone to enjoy. 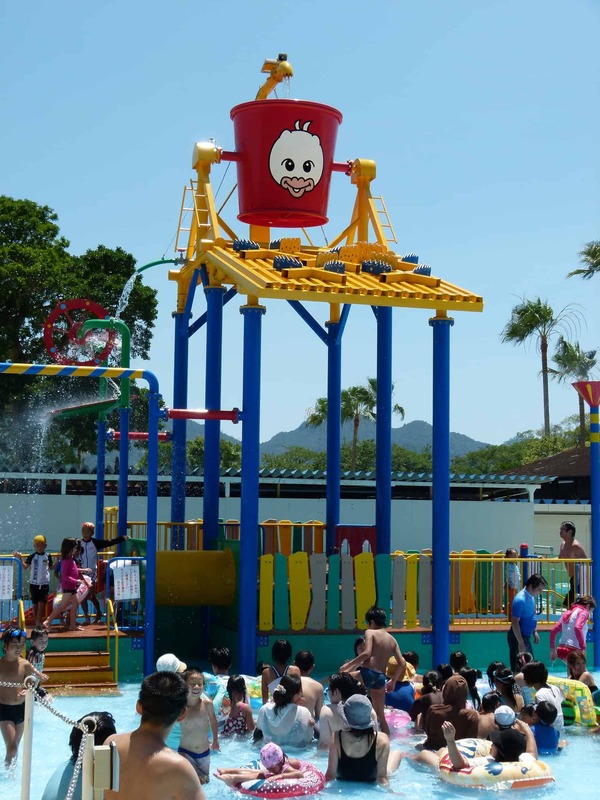 Next to the pool is the Chupi Park where kids can do activities in the “media plaza” (in Japanese) related to making a newspaper as these facilities are connected to the Chugoku Shimbun newspaper. Chupi pool is a fun water park consisting of 7 main attraction areas including a large water slide, current pool, wave pool and smaller water play attraction areas as well as a basic pool. 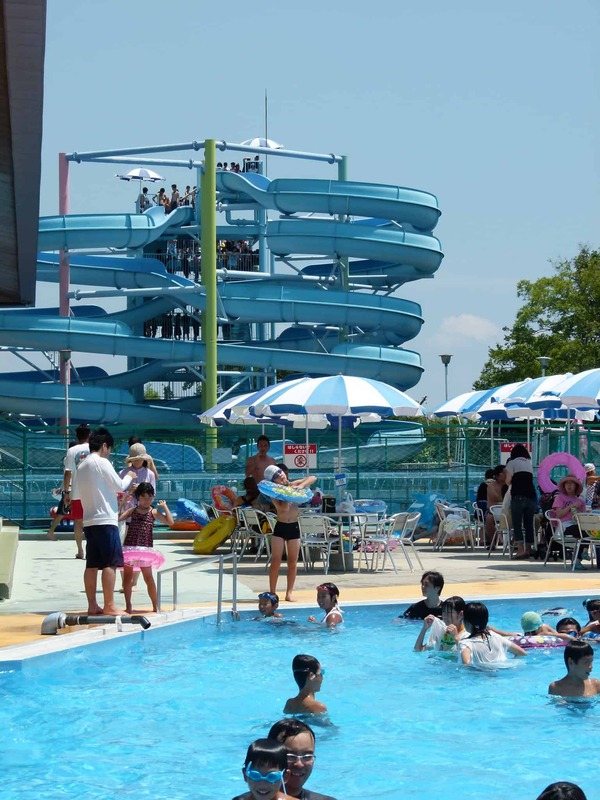 Open every year from mid/late July to September (7/9-10 & then everyday from 7/16 ~ 9/4 in 2016), the Chupi pool is Hiroshima’s only water park. It is located off the main road, just past the Miyajima ferry port, along route 2. The park is a bit bigger than the central Family Pool and is open a week later in September. There is a free shuttle bus from Miyajima-guchi train station which is a short walk from the Miyajima tram station too. Parking is ¥1000 for the day (500 car capacity). On Sat, Sun and Holidays prices are ¥1900 for adults, ¥1500 for elementary aged kids and up and preschool kids are ¥800 – there are slightly cheaper entrance fees on weekdays. Half price entry is available between 3-5pm (park is open till 6pm). Chupi Pool is open 09:00-18:00 Mon-Sat and from o8:30 on Sundays and holidays. Although the staff are very friendly, there is no information or menu boards in English, nor do they have any staff that speak English so bring your phrasebook or a Japanese speaking friend. There are also some strict regulations such as no tattoos or body piercing allowed in the waterpark (which is actually the only English sign we saw). We had a friend who had tattoos and they had to be covered up so he could enter the park, body piercing would also have to be covered up or removed to gain entry. There seem to be a fair number of lifeguards, staff and people cleaning the premises and sorting trash for park users, overall, it seems to be quite efficiently run. Other regulations include disallowing masks and snorkels (although goggles are ok), boats and such (although rings and balls are allowed). There is also only smoking allowed in designated areas of the facility. Everyone must also obey the ku-kei resting rule and get out of the water for 10 minutes on the hour, every hour. Private shaded areas are available for rent, usually costing 3,000 yen for the day. There are also swim floaters, suits, towels, goggles and sunscreen available in the small shop near the entrance. There is a fair bit of food available from stalls which serve festival favorites like okonomiyaki vegetable & meat layered pancake, takoyaki octopus dumplings, yakisoba fried noodles, karage fried chicken, french fries, ice-cream, beer, drinks, kaki-gori shaved ice, udon noodles are the main offerings. Most food and drinks are reasonably priced. The normal prices are available at the drink machines and food and drink at the stalls cost between 300~500 yen. There is also a small game center, shaded general seating area, shaded areas to stand and eat food from the stalls, massage area, a fair number of port-a-potty toilets and coin lockers, but no changing areas that we could find. Nice way to cool off, but expensive to get in (cheapest at discount times is 1,000 yen each), parking is free within 60 min then flat rate of 1,000 yen & if you want to sit anywhere minimum charge 500 yen, put a bag down 100 yen, lockers 400 yen. Toilets & changing areas are old, moldy & hot. Water in all pools uncomfortably warm. Only 1 shower has cold water. No water fountains & no free shaded areas. On plus, it’s great there’s a outdoor water park in the area. Great views of surroundings from top of water slides. Very crowded especially on weekends. Seems like it could be better with a little effort. For example, an outdoor, shaded cafe area in view of surrounding forests & pools. Would be nice for couples & parents with kids that don’t need supervision. A simple, clean changing room (away from showers & toilets) cooled with a few fans. Free shaded areas near pools for parents watching kids swim. Night time swim events 1/week till 10pm with glow-in-dark pool floaties & moon viewing swimming. Would be esp great on night of Miyajima fireworks!